Why do I like (Roland) synth’s/samplers from the 80-ties? Nowadays you only need a powerful mac or pc, a piece of (freeware) DAW/sequencing software, some plug-ins, a decent audio interface and a couple of speakers to create some great music. 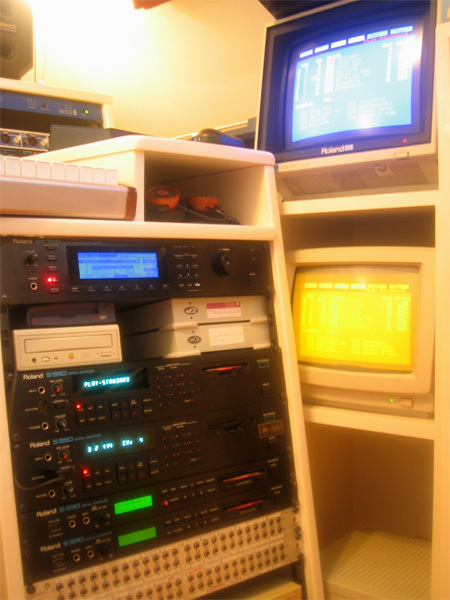 Software samplers with libraries of several tens or hundreds of GB’s are no exception. With all those big libraries you can achieve very convincing, realistic results. But to my ears it’s often too sterile, too clean, too perfect. This is where my love for 80-ties (and early nineties) stuff comes into play. I’ve got a bunch of Roland 12 bit samplers (S-550’s and S-330’s), all bought within the last 5 years. They all have tiny memories, not even 1 MB, they miss all the detail, finesse and ease of use of modern sample players/sample libraries, but the instruments and libraries created for them have one thing: character. Two years ago I bought a Roland JX-10 for something like €300,-. This is a great synth, especially for pads or hard synced sounds. If you’d compare it with something like a NI Massive virtual synth, a fantastic plug-in, I still would choose the JX-10 soundwise. Why: character, warmness and just fat sounding. Although the NI Massive can produce trouser-flappering bass, it again sounds too sterile and clean to my ears…. Another thing that strikes me is the build quality. All my Roland gear is still working perfectly. Only trouble I had was the FX board of my MKS-20 that died, Roland Benelux did a great job fixing it. Thumbs up, they still service 20+ year gear!! Another favorite of mine is the MKB-1000. It’s a master keyboard, with a wooden keyboard, which is a joy to play. The thing is build like a tank, it weights about 50kg (100 Ibs), and is virtually indestructible. It’s a fairly simple device, but it does what it must do, and does it without problems since 1984. Another great Roland machine, the S-750 sampler (1991). Specs are 16 bit, 18 MB sample memory, the GUI monitor output/mouse (like the S-550/330) makes it a breeze to use. Fantastic DA convertors by Apogee and a very pleasant sounding filter. Again, loading samples with modern software counterparts is a lot faster, I still like working with it. There’s a great Roland library (S7x0, for S-770, S-750, SP-700,S-760 and DJ-70 (mkII)), co-created by Eric Persing, founder of Spectrasonics. Highlights of this library are i.m.o. the “Keyboards of the 60-ties and 70-ties” Vol. 1 & 2 and “Orchestral Family” Vol. 1 & 2. When they were released the Orchestral family would cost about fl.1200,- (€500,-), now you can buy it (if you are lucky, you don’t come across them that often) for something like €50-€100,-. It doesn’t have the detail of -for example- the VSL library, but when used in a mix it holds its place better than the VSL library. I often use ’em both when doing classical oriented tracks, when you layer them it broadens the sound, partly to do with slightly different tuning. Don’t see this post as an add for Roland, I’m not a huge fan of their new products (with the V-piano as exception, can’t wait to see spin-offs of this in other products, right now I think it’s too expensive), but I want to make clear that back in the days they built machines where costs were of minor importance of build and sound quality. Of course, more companies built great equipment, but I have the most experience with Roland. Today I feel that most things (not only musical instruments) are produced to make the most profit for the company, not to create the best possible instruments. I’m afraid that you can’t turn it back. However, the good news is that you can buy these (underestimated) classics for almost nothing and -within their boundaries of technical performance- you can create some fantastic sounding music! Thank you! Enjoy your purchase! !